When you think of granola, I bet you’re thinking it’s a great for breakfast or a snack. Well, how about using it to make a crust for shrimp!?!? I know, as crazy as it sounds but it was oh so good! I’m a participant in the First Annual Golden Girl Granola Blogger Recipe Challenge and came up with this recipe for shrimp using their Truly Tropical granola. First, the granola is amazing! It’s packed with delicious ingredients like dried mango, coconut and cashews….just the perfect amount of sweetness too. I had a hard time not eating the entire bag when I sampled it before deciding on how I was going to use it in a recipe. 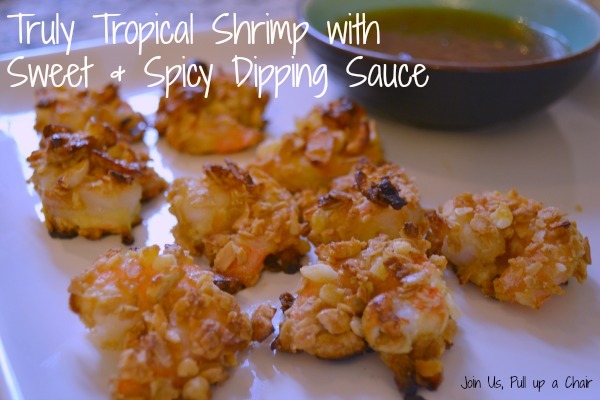 The shrimp came out great and really reminded us all of coconut shrimp but much more crunchy and sweeter. I served it with a sweet and spicy dipping sauce and cole slaw. My eight-year old daughter loved them and keep sneaking a few more after dinner. Preheat oven to 425 degrees. Spray a baking sheet with non-stick cooking spray and set aside. Prepare your dipping station. Flour in a small bowl, egg in a small bowl and the roughly chopped granola in another bowl. Season the shrimp with the salt. Dip the shrimp in the flour and shake off any excess. Dip into the egg and then into the granola. Evenly coat the shrimp with the granola and place on the prepared baking sheet. Continue the process until all your shrimp are coated. Lightly spray the tops with the non-stick cooking spray. Bake for 8 to 10 minutes or until the granola is crispy and the shrimp are cooked through. I had small shrimp so mine were one in 8 minutes. You’ll need to keep an eye on them so the sugars in the dried fruit don’t burn. To make the dipping sauce, mix together the apricot preserves, rice wine vinegar and red pepper flakes. Enjoy! Golden Girl Granola is a family based business in MA that takes pride in their granola by using only the finest ingredients and stirring each batch of granola by hand. Check out all the other flavors of granola!